Sushi is recognized as an international food in various countries. Sushi which was known as a high-class dish in Japan, but it made sushi national family food that the style of Kaiten Sushi, conveyor belt sushi, invented in 1958 by Shiraishi Yoshiaki who operated the sushi restaurant. Kaiten Sushi, conveyor belt sushi, was born with hints from the “belt conveyor” used in the production line of the beer factory. 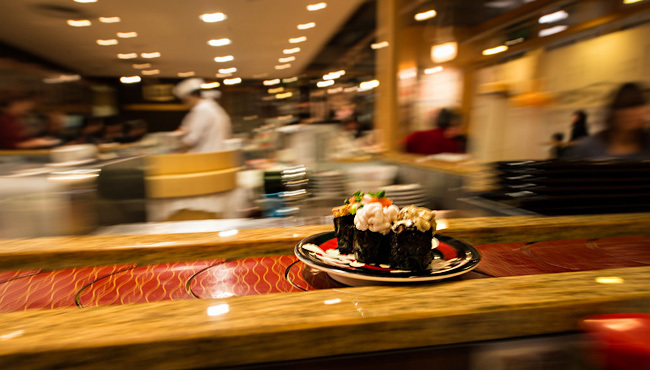 Nowadays more shops offering good quality ,like high-end sushi restaurants, with good price. Here is the list of “high quality + good price” Kaiten sushi restaurants from Tokyo, so why don’t you try them when you came to Japan! Gatten Sushi is a sushi shop that ranked No. 1 in the “Kaiten Sushi” customer satisfaction ranking in FY 2014. Although it is high price zone in Kaiten sushi, but still good price and of course good taste! “Sushi Zanmai Tsukiji branch” is located in the hottest spot for Sushi restaurant in Tokyo.The price is just a bit higher than the other Kaiten Sushi restaurants, but it is worth paying. Sushi Zanmai is known for buying tuna of the highest value and price of Tsukiji fish market every year. if you want to enjoy real tuna, you should try Sushi Zanmai!!! Midori is widely known in Japan as a long-established “Washoku” restaurant in Kyoto. “Katsu Midori” is Midori group’s sushi restaurant. Whoever wants to enjoy the sushi with “Washoku spirits”, please try it! Standing Sushi bar “Uogashi Nihonichi” offers lower price than Kaiten sushi and high quality sushi in Shibuya. You can eat delicious sushi from 75 yen (1US$)!If you want to eat cheap and delicious sushi, this pace will be the one of the great choice for you!